This month, many parents are delivering their brand-new high school grads with loads of college stuff to dorm rooms across the country. Then these parents will say goodbye and head for an emptier home. Inevitably, many will post on social media. I’m onto you, friends. Already, I see your photos in my Facebook feed. I see your teenagers, posing uncomfortably in their newly set-up dorm rooms. I see photos of middle-aged parents flanking their teenagers before saying goodbye. Everyone is all smiles, but I see that look in your eyes. I read your posts. Bouncing in between your words of pride, I hear the reverberations of loss and anxiety. When I read your posts, my heart breaks a little for you. I want to cry out, “Please, please focus on what is so awesome about this day! You have so much for which to be grateful! They made it! You did it!” I want to remind you how good you have it. “You can text them anytime and they might just respond. You will see them at Thanksgiving. Best of all, you stand a reasonable chance that your children will return home to you healthy and happy next May.” I had none of these assurances four years ago. But then I remember that comparisons are uncharitable. Comparisons create the space for pity to creep in; we feel better about ourselves only because others are worse off. On the flipside of that comparison comes a sense of entitlement; others have no right to their pain because we have it so much worse. Neither pity nor entitlement evokes empathy. On the other hand, comparisons do offer a different perspective and perspective can shift the focus away from what we’ve lost, towards what we retain and what we gain. This week, I send all three of my children off to college. My daughter will begin her fourth of five years at a small university in rural Virginia. My two sons, five years apart, will begin their freshman years, the younger at a mid-size university outside Baltimore and my eldest, my former Marine, at a large university in Pennsylvania. When the last one leaves, a part of my life will be done. I expect that I will grieve. Yes, I will worry about them. (Universities are still full of perils!) Yes, I will miss them. Yes, I expect to be lonely at times. Yet, I have much for which to be grateful. There are stark differences between my realities of this week and four years ago. It is hard to describe what it is like to send your child to a combat zone. Let me try by analogy. A father waits to send his son off to war. In a few ways, the scenes look similar. The barracks vaguely resemble dormitories, three-story brick buildings arranged in a rectangle. Many young people in their late teens and early twenties move about. Music blares from open windows. Luggage and personal belongings are arranged in piles on the grounds. Families gather around to say goodbye. That’s where the similarities end. These young men are leaving, not arriving. The piles of luggage are camouflage duffle bags. Let’s say that your child’s dormitory houses about 900 students. Imagine looking at their faces as they carry their boxes of clothes and electronics up to their dorm rooms. They are both excited and anxious as they embark on a new adventure. Look at their faces again. Ten, maybe fifteen, of them will die before the end of the academic year. Which ones, you wonder? Another 150 to 200 of these students will be injured. Many of them will lose limbs or sustain traumatic brain injuries. What about the remaining 700 students, you might wonder? How will they fare by next May? Many, if not most, will return home next summer with mild to severe post-traumatic stress disorder. Their bodies will be intact, but depression, suicidal thoughts, and anxiety may make their return to academics in the following fall difficult or impossible. This comparison is melodramatic, I know. Still, one day in July, I watched the young men of 1/6 Bravo Company carry their packed sea bags to the waiting trucks. I watched them gather their families around for one last hug before they boarded the buses that would take them away. 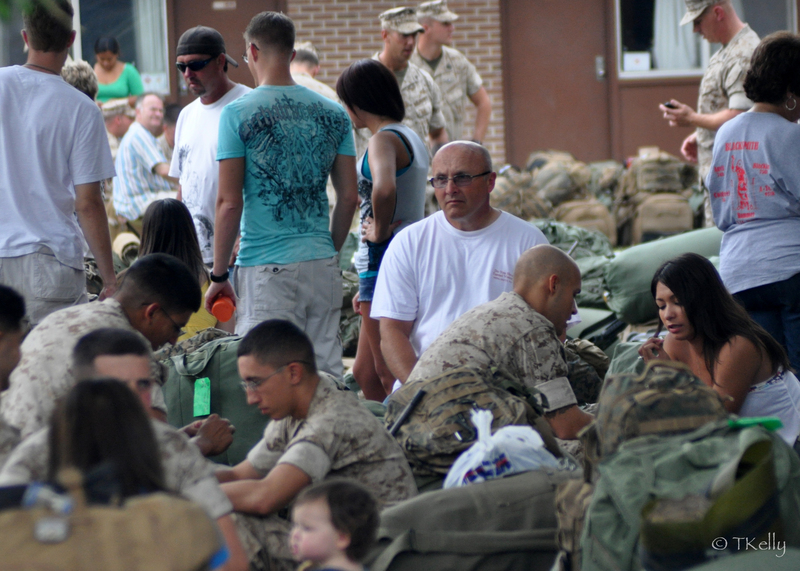 I knew that each Marine, and each family, was weighing the odds. To which fate will they land? Is it too much for me to hope that my son lands in the “intact in body, mind, and spirit” bin? Does this wish mean I have consigned another to a less fortunate bin? On my worst day, our family waited for hours in in the quad on the trampled remnants of green grass. We sat in portable chairs around a cooler, sipping sodas and nibbling snacks. We sat across the sidewalk from our son’s pile of gear; a pile of camouflaged duffle bags among all the other piles from his platoon. On top of this pile was his M249 squad automatic weapon, the weapon that would save his life and take lives. We pretended that these last few hours together were somehow normal. Saying goodbye that day was difficult. How does a mother choose the moment that just might be the last? As for me, I knew that I couldn’t bear to watch my 19-year old-son board the bus that would take him to a plane that would take him to Maine, where he would board another plane to Germany, and another which would bring him to one of the most violent areas of Afghanistan. So I watched him stand in formation with his squad. 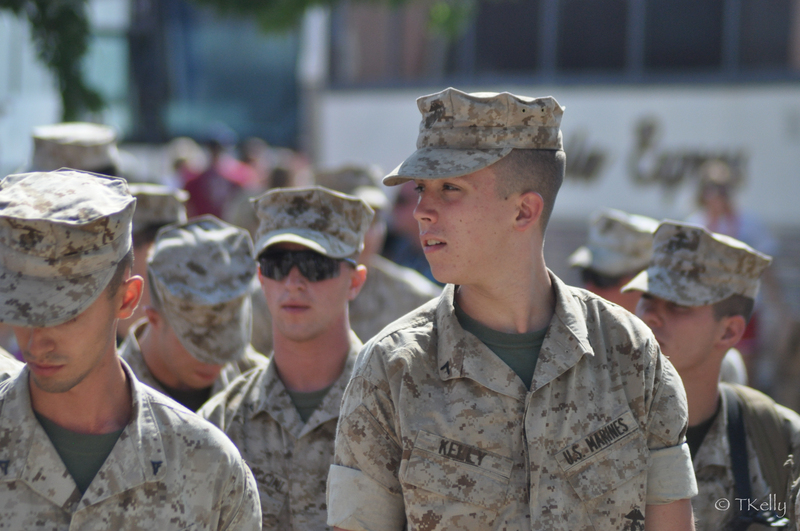 I watched the young Marines go through one last weapons check. I snapped a photo. I turned my back and walked away. The lesson that I learned in perspective was one forged out of fear and anxiety and separation. It is a lesson that I wish I could spare every parent. Parents, be kind to yourselves. Your grief, your longing, the bitter and sweet of loss and pride are valid feelings. The disquiet caused by your separation from your child is real. Yet this is a good day. © Tracey E. Kelly and revtkelly@wordpress.com, 2015. All rights reserved. Powerful post, Tracy. I was especially interested in your thoughts about comparisons in the middle. And the whole post made me affirm that we need to do whatever is possible to avoid sending our children / any child off to war. Tracey, it seems like yesterday that you told me your son was heading off to war. I prayed everyday that I wouldn’t meet him on the airstrip of Andrews, en route to Walter Reed. Powerful, beautifully written article. This is the second time I am reading this and I just realized that I was there with you My son also deployed with the 1/6 that July. The way you captured the experience leaves me speechless, was very accurate. I have also brought children to college and it is hard not to compare. Enjoy your children in all phases of live. Thank you, JoAnn. You and I were also in the same Facebook group of Bravo family and friends during the deployment. What a blessing you all were during a very difficult seven months.